The brand new super tiny Muvi Atom redefines the world of small. Measuring less than 2 inches high its ones of the smallest camcorders in the world. 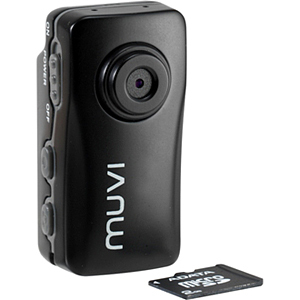 The Muvi Atom tiny size does not compromise quality recording at 640x480 @ 30 FPS using Frame Rate Enhancement technology. The Atom also introduces the ability to take photo snapshots @ 1280x960 and comes bundled with the 2GB Micro SD card and sports mounting kit.